Dining stretch ceilings . Various forms . The classical form of stretch ceiling is a flat plane. Can be used both in a strictly horizontal level and at any angle. Suspended ceiling will look like a perfectly smooth and flat, which is a solution to the problems leveling base ceiling , conceal possible differences , cracks and any structural elements underlying premises . Regardless of the form may be made in any shade of color gamut " one hundred nine ," and in the desired textural decision. For use in areas of different configurations , including rooms with columns , chimneys, lots of corners and irregular geometry. 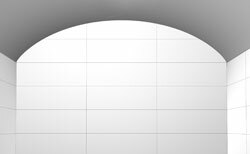 Location relative to the base of a stretch ceiling is possible to any desired height . The minimum distance from the base ceiling - 3 cm ceiling can build various essential elements - lighting , chandeliers, HVAC systems , sensors and fire alarm systems in the required quantity and desired location . Use of this form of stretch ceiling allows for overlapping spaces of any size perfectly flat surface. Form, characterized by the transition from one level of the ceiling to the other. This design of the stretch ceiling - one of the richest variations. 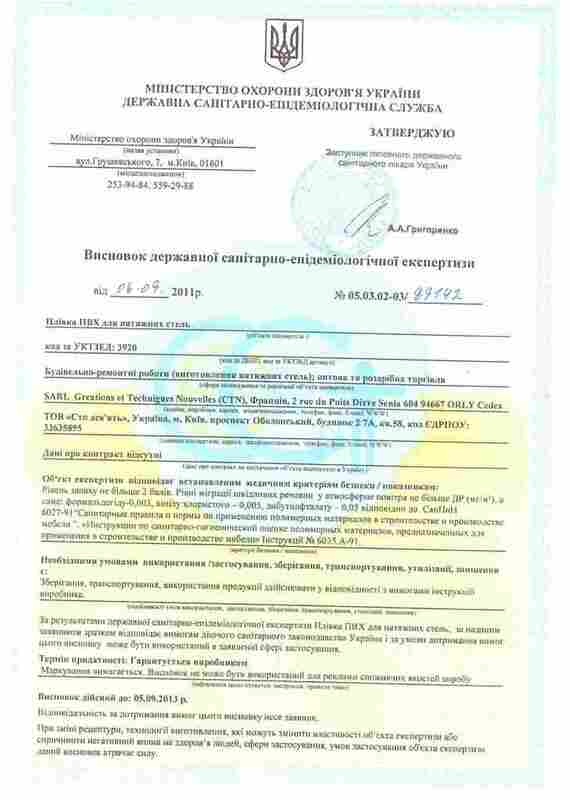 Technically unlimited number of levels . Multilevel ceiling interesting combination of different textures and colors . Especially effective is the combination of level transition and bending . Using the ceiling level with the transition to visually divide the room into different functional- semantic groups , creating an interior in one independent zones . In the same way it is possible to emphasize the elements of decor and interior , repeating their shape (and possibly color) on the ceiling. An additional effect of increasing the amount of space is achieved through the contrast of textures and colors in different levels. Due to the design level transition can locally hide unwanted elements protruding ceiling and walls, without losing the overall height of the interior space and elegance . Many variations with different levels of suspended ceilings " NINE HUNDRED " will help to realize a design idea in any technically sophisticated interior. Stretch ceiling in the shape of an arch . Characterized by a smooth transition to the walls to the ceiling . Used to change the standard rectangular geometry of the room and giving it a new form , as well as reproducing the domed ceiling vaults . Used as one , and with several sides of the room , or on the perimeter. The last option arrangement arches can be reduced to a dome shape . The radius of curvature and the level of recovery of suspended ceilings arches " NINE HUNDRED " varies freely to the required limits. Ability to remove and then return to the place of a stretch ceiling " one hundred nine " you can use it as a decorative element in the places where the various communications that require periodic access. In case of emergency communication with tubes suspended ceiling is a real protection of the interior from water leaks , and possibly from fraying over time fines base ceiling . The latter property is especially important for the reconstruction of basic arched ceilings. This is one of the original forms of ceilings " NINE HUNDRED ", allowing to simulate the arch as indoor and recreate , and perhaps give a more interesting look old arch design . The local form of the stretch ceiling in the form of a bell . Gives the room a nontrivial form . Original style ceiling is achieved by volume , three-dimensional shape , visually reminiscent of the hills or dunes . Crater , only inside. Particularly harmonious combination looks dunes and various designs of fixtures. Varying the diameter and depth of the design makes it possible to obtain different forms of dunes. Boundary of the transition from the dunes to the main plane of the stretch ceiling can be as smooth and having a clear outline . The number and dimension of the dunes on the ceiling actually ogranicheny.Tak well as all forms of stretch ceilings " NINE HUNDRED " , dunes can be combined with other forms of the same ceiling. Especially interesting effect - the reflection of light in the dunes , made ​​of glossy textures. Dune is one of the volumetric forms " one hundred nine " , successfully used both in classical and avant-garde in the interiors. 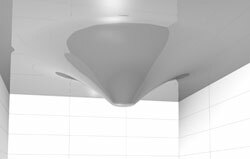 Form stretch ceiling in a drop-down cone. Used to create unusual shapes and adds the element to the interior decor . You can use CONE both as a separate object , and for combination with other elements of decor. So , this form allows for a smooth transition to the ceiling columns , moreover, it can help you beat the ventilation or create an unusual design light design . In combination with other complex forms of stretch ceilings " one hundred nine " possible to create three-dimensional futuristic designs. Cone-shaped and have a variety of textured color version , their diameter and height vary freely . 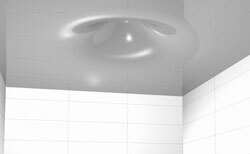 This form can be both a design , seamlessly extending from ground level stretch ceiling and a separate element . In the latter case, the most interesting game of color contrast and color of the base of the cone ceiling. Harping various ideas for design of the interior portion of the lower cone can be made in the form of droplets , the truncated plane (like a hole and hollow ) having a bottom surface of a variety of shapes : oval, circle , rectangle , square. A combination of several cones in one figure. 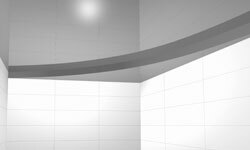 Form ceiling , characterized by smooth curves in the vertical plane , which resembles a wave. One of the hardest and most beautiful forms of stretch ceiling " one hundred nine ." Depending on the design decision step and wave height can vary constructively . Number of wave crests can be anything. Where it may be different wave forms : uniform , gradually decaying , changing pitch and ridges. 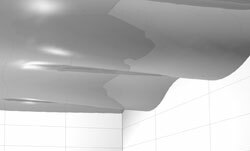 Wave can be implemented in various configurations along one wall - one-way , along two walls - two-way , four or more along the walls - multilateral , in the latter case the ceiling resembles the surface of the sea. Most commonly used waveform using dark glossy ceiling " one hundred nine ," in such a set of smooth waveforms with reflection varnish textures creates a unique effect of shoals waves ... Among the many variations of forms of stretch ceilings " one hundred nine " for each of the interior , you can pick up a form , which most successfully embody conceived design concept .